Change is said to be the only constant in life. Technology has made this change faster and more disruptive than ever before. What was science fiction a decade ago, is fast becoming a reality and may not exist in the same form, in future. How do enterprises prepare to anticipate & shape the future? How do enterprises make the leap to Digitalization and eventually to become Intelligent Enterprises? Climate Change may have been disputed by some world leaders, but very few people will question the reality of the changes in the Business Climate. Increased market competition, ever-demanding customer expectations, regulatory scrutiny has brought a need for CxOs to focus on business sustainability, growth through big bet transformations, mergers & acquisitions, cost optimization, agility to change, using data to derive insights on customer & markets and most importantly agility in IT & business process innovation. This change was slow in the beginning but picked up pace in recent times. Essentially there were 3 broadly distinct eras in the mainstream adoption of technology. These were not the actual invention period for these technologies but the phase when they became an indispensable part of mainstream business and human life. Before 2000 – Evolution of Technology to digitization. The last century can best be described as the evolution era of technology. The changes in the technology landscape were slow in coming but lasting in impact. Notable inventions included the nuclear power, airplanes, automobiles, rockets, submarines, televisions, radio, personal computers & the internet. The world had learnt to blow up themselves, go places, go to space, go underwater, get entertained and lastly work better to connect people together. The internet & personal computers accelerated the move to the future with new business applications being developed, that enhanced worker capability. This was the era for ERP, CRM, ECM, SCM, Office and other business applications. The focus of these applications was like the imperatives of the industrial revolution i.e. for businesses & workers to become more efficient and productive in the achievement of their objectives. 2000 to 2015 – SMAC & the digitalization wave. The age of the internet spawned the arrival of the next wave of technologies which were Social, Mobile, Analytics & Cloud. These started the ‘Revolutionary Phase’ of technology and brought in newer ways of commerce, information dissemination & collaboration in the business landscape. Technology moved from being disjointed applications aimed at productivity to becoming ‘platforms of human collaboration’ for businesses finding newer ways to engage, acquire, service, retain customers, create new service and revenue offerings. This was also the era of information technology becoming unchained from personal computers and truly mobile, with the advent of smartphone devices as alternatives to traditional computing devices. The erstwhile platforms of collaboration led to the next stage of technology evolution which was essentially ‘human to machine’ & ‘machine to machine’ interaction & collaboration. 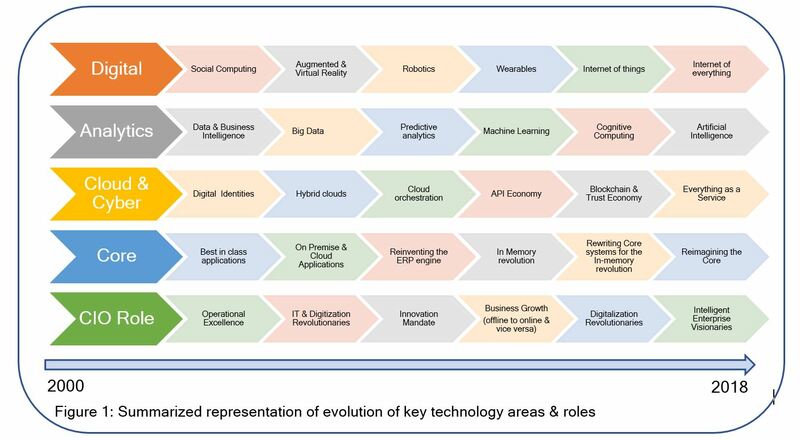 Thus, came in an era of everywhere computing, Internet of Things, Advanced analytics & Machine learning, Internet of everything, Artificial Intelligence, Intelligent apps, intelligent & autonomous devices(robots), digital twins, conversational platforms, immersive experiences (virtual, augmented & mixed reality), blockchain & distributed ledgers, event driven(sensing) business models, adaptive risk & trust approaches and the list goes on. Technology products are combining with technology platforms and are now strategically positioned to become business & human innovation platforms. The ability of businesses to adopt technology depends on multiple factors namely their people, their processes and their technology landscape. Key questions which affect their ability include what is the overall organization culture when it comes to innovation and change? Are they fast and nimble or are they slow and methodical? What is their current or near-term appetite for business change? What are their major successes/failures from their past experiences/recent history? Are their processes mature & stable? Or are they unstandardized or unharmonized? Are they sufficient to meet the organizations stated goals & targets or are there significant pain points which can be resolved? What is the level of maturity of their current Technology landscape? Where are they on their current technology roadmaps? What were the most recent technology investment decisions and how do they need to evolve? Early mover advantages lead to market leadership getting solidified. Chasing every technology trend due to with a ‘Fear of missing out (FOMO)’ on the next wave of technology is expensive. This also leads to ‘change fatigue’ for internal teams with multiple transformation initiatives year after year. The slow followers – These are usually the businesses who take an overly cautious approach to making investments in new technology. They do not face the challenges associated with technology which has not fully matured. Being cautious to adopt technology means the benefits from those technology investments will be delayed and largely mainstream by the time they are adopted. Businesses no longer have the luxury of sitting on the sidelines and surfing selective waves of technology. The number of industries that have been disrupted by technology is a topic for another day, but a few notable examples are Google which has disrupted multiple industries from advertising to travel on the backbone of Search, Apple which has disrupted the electronics & the entertainment industry, Amazon which started as a bookstore and is now the world’s largest cloud services provider. In the physical realm, we have instances of the world’s largest retailer, Walmart, entering the realm of E-commerce through the acquisition of Flipkart. Apple is entering the Auto industry with their plans for driverless cars. Amazon is making science fiction come true by bringing drones and robots, to a warehouse near you. Businesses not seeing the amount of change and being slow to respond – Limited awareness of technology trends and anticipation of its impact on their business. This increases the risk for them to be upstaged and lose their market share to more tech-savvy competitors. Decisions made with a quick-fix mindset or with a ‘Fear of missing out (FOMO)’ on the next wave of technology. These initiatives quickly run out of steam as they have not been thought through. Businesses becoming weary of change and companies facing internal conflicts and poor adoption to multiple waves of change. There is an underlying pressure on every level of the organization to keep up with wave after wave of technology changes. They also do not have the resources to climb every technological mountain that presents itself as an opportunity. The best approach is for companies to be consistently evaluating and exploring technology trends and trying to anticipate the future impact on their businesses. The emphasis needs to be the best-fit basis to the business reality comprising the people, processes and technology capability of the business. Business leaders should try to address key areas related to their people, processes & technology realities, to understand how to plan their technology journey from Digitized to Digitalized and to Intelligent Enterprises. The following picture is an example of a holistic framework for businesses to evaluate and plan their journey considering the impact on people, process and technology instead of only pain point centered or FOMO approaches. Finally, as advanced as technology has become, it is rarely a magic bullet. Even the most advanced technology will not last if it is not widely adopted and if businesses are not supported in its adoption. E.g.- the field of AI was born in the 1950s at a college in Dartmouth but was not really adopted till recently when the advances in related technology and business awareness made widespread adoption possible. Technology is like any other tool in that it needs to be used correctly to achieve business outcomes. The technology landscape itself will also get better and benefit from increasing and sustained adoption in varied and diverse use cases across industries. 5. Finally, help clients identify, quantify & sustain the value of benefits realized from these initiatives. 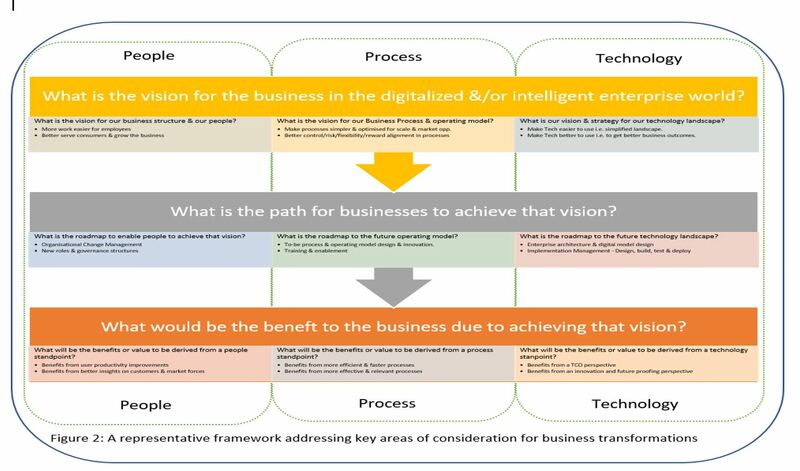 All these areas are critical to understanding and planning the way forward for any technology and business transformation initiative and only when business initiatives address these areas, will the customer transformation journeys to Intelligent enterprises be fully successful and the benefits, sustainable for the long term.